We are one of the biggest manufacturers and exporters of Jute Twine in India , exporting at present in South Korea, Japan and European countries viz: France, Germany etc. we need distributor in various country. Description : Jute twine in natural color and multiple colour in spool form of 50 gms, 100gms, 200 gms , 500 gms and 1000 gms per spool, well shrinked with label. Under the expert guidance of our skilled professionals, we offer a wide array of Green Jute Twine that is playing an active role in the making of biodegradable packaging material. Available in green shade, these twins are ideal for hessian bag repairs, sewing and tying. These Green Jute Twines are durable and can be availed in various sizes and patterns, as per client's specifications that too at nominal rates. 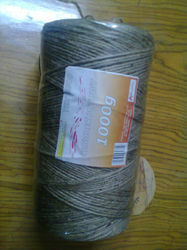 We are engaged in providing Jute Twine Spool 100 gms that are manufactured using quality raw material, procured from reliable vendors of the industry. These are generally used for hessian bag repairs, sewing and tying and thus offered in various sizes, lengths and dimensions. 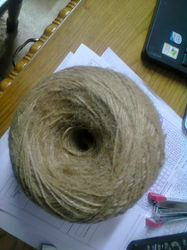 In addition to it, these Jute Twine Spools 100 GRM are highly acclaimed fir their softness and good twine qualities. We are the leading manufacturer and exporter of all kinds of Jute Twine 50gms Spool that are made of superior quality jute and plastic. These are widely used for various purposes including sewing, tying, packing pipe joints, cable binding, etc. 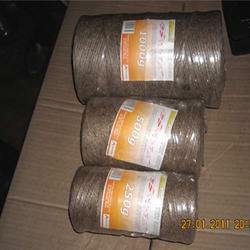 Offered at most affordable rates, these Jute Twine 50gms Spool are widely used and demanded by different clients across the globe. Owing to great quality, we manufacture and export an excellent quality range of Jute Ropes, which are popular in commercial as well as household purposes such as Binding, Packing sacks or any other commodity and Towing the animals to the cart. In addition, we are offering customization of Jute Ropes to our clients in accordance to their requirements. We are established traders and suppliers of a wide range Natural Jute Twines that are widely used for in arts, crafts, parcel and other general purpose packaging. Made from high grade raw material, these twins are known for easy handling and excellent knot holding. Available in variety of color combinations, these Natural Jute Twines are ideal for gardening due to its good tying strength. Our designers offer an enticing range of Binding Jute Rope that is made using smooth and soft fabric. These ropes feature strong, durable and high load bearing capacity features. These are well tested by experts to ensure their effectiveness and quality. Available in numerous different designs, these Binding Jute Ropes are offered at most nominal rates.